In December, the warm smell of freshly baked cookies — rich vanilla and butter — is as iconic as the smell of balsam. 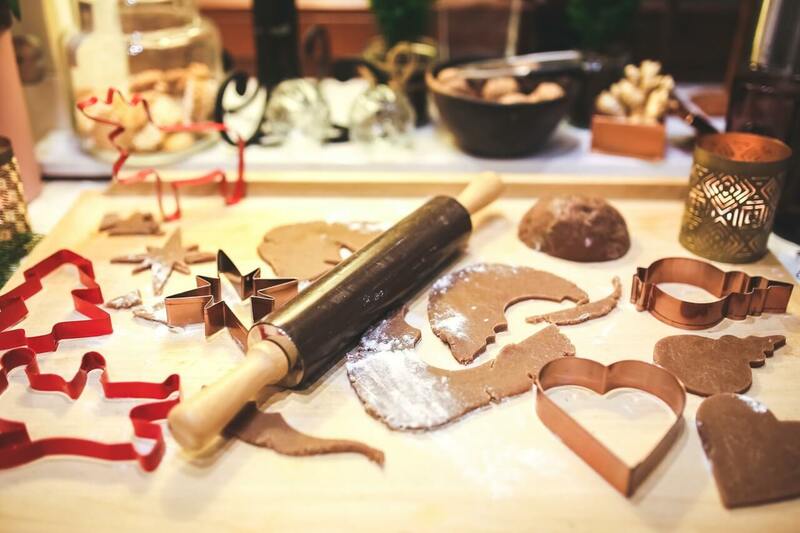 Baking and decorating cookies with loved ones is a long-standing holiday tradition in many households, as is indulging in pure buttery bliss in matching family pajamas on Christmas Eve. Fill your home with the scent of holiday joy this year with one of these popular cookie recipes from 2017. Enjoy Christmas cookies in matching family pajamas this holiday season. If filling your home with the warm scent of butter, vanilla, and cinnamon is your goal, look no farther than these beautiful Brown Butter Cinnamon Crinkle Cookies from Cookies & Cups. The powdered sugar that tops each delicious treat gives the cookies a snow-kissed look that is perfect for the holidays. Get the recipe from Cookies & Cups here. 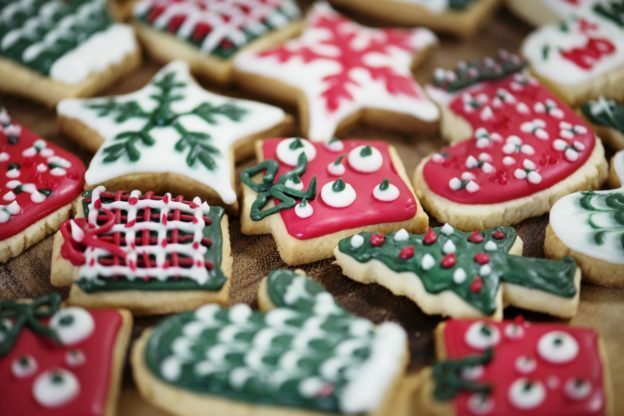 These cookies will be show-stoppers at your next Christmas party or family holiday event. Even the baking novice can expertly craft these beautiful slice-and-bake green and red Christmas Swirl Sugar Cookies from I Love My Organized Life, which are rolled in festive sprinkles to create a fun decorative edging around each pastry. Get the recipe from I Love My Organized Life here. People theorize that cookie lovers can be divided into two distinct subgroups: ‘soft and chewy’ or ‘thin and crunchy.’ For the ‘soft and chewy’ crowd, look no further than this perfect Soft and Chewy Snickerdoodles recipe from Tastes Better from Scratch. Buttery soft, these cookies melt in your mouth and are guaranteed to be Santa’s favorite! Get the recipe from Tastes Better from Scratch here. The holidays are for indulging… Okay, the holidays are for over indulging and cookies do not get more indulgent than these. These 5-Ingredient Oreo Cheesecake Cookies from Baker by Nature are essentially little bites of cheesecake with a decadent Oreo cookie crust. The only thing better than one dessert is two desserts in one. Get the recipe from Baker by Nature here. 5. Twix Cookies from This Grandma Is Fun! These cookies are as beautiful as they are joyful — just what you would expect from a fun grandma! The Twix candy bar is a childhood favorite and this cookie will be a childhood favorite too. A homemade version of the candy classic, these Twix Cookies from This Grandma Is Fun! (TGIF!) have the perfect combination of crunchy homemade shortbread, chewy caramel, and a delicious dollop of milk chocolate. A surefire hit. Get the recipe from TGIF here. This is a wonderful, foolproof recipe for a holiday classic. The key is selecting a variety of different fruit preserves to use in the recipe — apricot, strawberry, blackberry — creating a colorful presentation reminiscent of Christmas ornaments. These Buttery Jam Thumbprint Cookies from Chew Out Loud turn out each and every time, so they’re well worth the effort. Get the recipe from Chew Out Loud here. While this is technically a recipe for a cookie bar, it’s actually more akin to a candy bar. These Chocolate Caramel Pretzel Bars from Tastes Better from Scratch are surprisingly quick and easy to throw together. Despite the caramel, they don’t even require a candy thermometer. You can enjoy the salty sweet goodness of chocolate and pretzels in just 35 minutes! Perfect for the lazy baker. This is a lovely name for a cookie that we all grew up with. If you or your kiddos are fans of peanut butter cups (who isn’t?) this is the perfect combination of peanut butter and chocolate. These Peanut Butter Blossom Cookies from Cincy Shopper are thumbprint cookies with a Hershey’s Kiss baked inside the thumbprint. The chewy peanut butter cookie base is the perfect vehicle for that rich milk chocolate. This is a kid-friendly recipe, so get the little ones involved. Be sure to pick up plenty of extra chocolate Kisses, in case Santa’s helpers get hungry! Get the recipe from Cincy Shopper here. Also known as Italian Wedding Cookies or Mexican Wedding Cookies, these Snowball Christmas Cookies from Wicked Good Kitchen look as you would imagine: like a perfectly round snowball. Despite being completely coated in confectioners’ sugar, the cookies themselves are not sickeningly sweet. These are a wonderful alternative for those who are seeking an alternative to candy-colored sugar cookies. They go perfectly with a cup of coffee in the morning, much like a tiny scone. Get the recipe from Wicked Good Kitchen here. This recipe might be one of the most popular ‘pins’ circulating on Pinterest right now. These delicious S’Mores Cookie Cups from Together as Family embody everything we love about the winter. Warm cookies, roasted marshmallow, and melting chocolate will make you feel like you’re sitting by the fire — even if you’re just sitting in front of the Yule Log on your television screen. Get the recipe from Together as Family here. For more ideas for getting festive in your PJs this holiday season, visit The Pajama Company at our blog, thepajamacompany.com/blog. This entry was posted in Christmas Pajamas, Family, Family Fun, Family Fun, Favorite Things to Do in Pajamas, Flannel Pajamas, Footies, Happiness, Hibernation, Holidays, Kids Pajamas, Matching Family Footies, Matching Family Pajamas, Winter, Yummy Recipe and tagged baking, christmas, christmas cookies, christmas eve, christmas gifts, christmas pajamas, cookies, family, family activities, family traditions, Fashion, Flannel Pajamas, footie pajamas, Gifts, holidays, kids activies, Matching Family Pajamas, pajamas, recipes, shopping, tradition, Winter on December 18, 2017 by admin.